The Panthers have won their second consecutive championship and are back on top in Florida. They showed up to the Lakeland Center where they took on Orlando Edgewater in the class 7A state championship where they won in convincing fashion, 75-43. “There were a lot of good teams up there; we just wanted to go out there and not make it even.” Coach Darryl Burrows said. This win gives him his seventh overall state title, tying Melvin Randall of Blanche Ely. Coach Burrows has done it with one school. The Panthers have won four consecutive state titles from 2000-2003. This is their first back to back championship since 2003. They also won their fifth title in 2008. “The legacy was built before I got there; it was started by the past coaches.” Burrows also said. In the second quarter, Dillard went on an impressive 22-0 run; they set up this run by scoring inside. Whether it was setting up the offense or scoring easy lay ups on the fast break, they were determined to pound it inside, scoring a total of 48 points in the paint. The Panthers also put on suffocating defense, only allowing Edgewater to shoot 23% from the field; they also outrebounded them 47-19.Leading scorer Jordan Wright contributed with 23 points while Raiquan Gray also contributed by scoring 16 points and 11 rebounds. Robert Allen of Edgewater scored 16 points and Anfernee Simons scored 10 points. 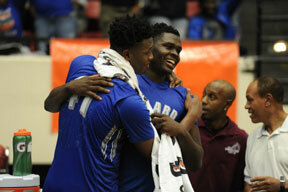 Dillard is the third school from Ft. Lauderdale to bring a title to Broward County this season. Earlier Saturday, Calvary Christian won the 5A title, and Westminster Academy won the 4A title. Congratulations to Fort Lauderdale for the titles. They have competed and left their blood, sweat, and tears on the hardwood. Dolphins Win Thriller on Sunday: are they Still Alive?